One of the hazards or working in a small office, shop or workshop is that illnesses can get passed around very quickly. This is even worse when your work premises are pat of your family home, especially if you have kids who are always catching bugs at school. And when everybody involved with your business is part of the same family, there will inevitable be times when you're all sick at once. What can you do yo keep the business going when everyone needs sick leave? As with so many things in business, it's best to try and prepare for problems like this before they happen. One way to do this is to take out business insurance, which can help to protect you against loss of earnings due to illness. You may also wish to put aside some money so that you can pay for an agency secretary to come in and take care of day to day administration in your absence. In this case you should also prepare a set of instructions in advance. It's a good idea to keep an up to date list of your important clients so that they can be contacted - by a secretary or, with minimal effort, by you - if you're going to have to delay negotiations or trade arrangements with them due to illness. Set aside some time each week (or, if you're really active, each day) to make sure this is in useful condition. Talk to other family members who are not part of the business or of your immediate household and make sure they have a good general idea about what the business is doing. That way there will be other trusted people available to give advice to temporary staff if you are unfit to do so yourself. Consider paying for everyone in your household and family business to get an annual 'flu jab. This can be a sound financial investment as well as helping to protect your family's health. 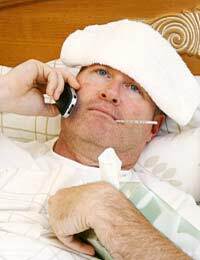 Due to the risk of everyone getting infected, it's a good idea to offer sick leave as soon as a member of your business team comes down with something, even if they still feel capable of working. This will often prove less expensive than dealing with your whole staff getting ill. When dealing with sick family members, practise good hygiene, such as frequent hand washing, to minimise your chances of getting infected. If you feel that it's essential for you to work despite your illness, be sensible in your approach to doing so. Don't push yourself - only work for short periods at a time and get plenty of rest. Keep yourself warm and drink plenty of water. Consider working from a laptop in bed rather than from your desk. Remember that some illnesses can affect your reasoning ability, even if you feel that you're okay mentally, and try to delay making big decisions. When you've been off on sick leave, it's important to manage your return to work carefully so that you don't exhaust yourself and make yourself ill again. For this reason you should carefully prioritise the work that needs to be done. Don't try to catch up all at once. If it's too much for you, call in extra help to deal with tasks that don't require management skills or the personal touch. If you've been forced to neglect clients or trading partners because of your illness, your top priority should be getting in touch with them, thanking them for any 'get well soon' notes and letting them know that you're ready to do business again. Don't see this as an awkward, unprofessional situation - make use of it as an opportunity for the sort of honest human contact that can help to build trusting business relationships. It's inevitable that illness will occur from time to time within your family business, but if you approach it sensibly, it doesn't need to have a serious effect on the work you're doing. Good preparation and good management of illness will enable you to stop worrying about the business and concentrate on getting well.